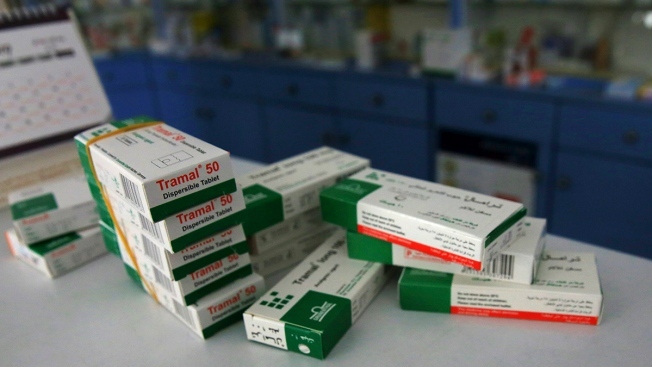 In this Friday, Feb. 15, 2019, photo, boxes of Tramal, an addictive pain killer, are stacked on the table of a pharmacy in Gaza City. Tramal, believed to be a more addictive form of Tramadol, gained popularity after the first war between Hamas and Israel in 2009. An opioid crisis has quietly spread in the Gaza Strip, trapping thousands in the hell of addiction and adding another layer of misery to the blockaded and impoverished coastal territory. The scourge can be traced to the mass import of cheap opioid-based Tramadol pain pills through smuggling tunnels under Gaza's border more than a decade ago. A more addictive black-market form of the drug called Tramal has since taken hold. "I have seen the top elites taking it — university students, girls and respectful people," said Dr. Fadel Ashour, who treats addicts in his dimly lit clinic. There are no reliable estimates for the number of addicts in Gaza, a conservative society of 2 million where it is considered shameful to admit to such a problem. A 2017 study by the World Health Organization estimated that 10,047 males over the age of 15 were "high-risk drug users." Ashour, a psychiatrist, neurologist and professor at Gaza's al-Azhar University, believes the number is much higher. Prices have shot up in recent years as a result of tunnel closures and an anti-drug campaign by the ruling Islamic militant group Hamas. Yet for the vast majority of sufferers, rehab isn't available for those who can no longer finance the habit. Israel and Egypt imposed a blockade on Gaza after Hamas took over in 2007. Aimed at preventing arms from reaching Hamas, the blockade largely closed Gaza's borders, making it extremely difficult for people to move in and out of the territory and devastating the economy. As conditions worsened, a thriving smuggling industry along the Egyptian border pumped in a cheap supply of Tramadol, an addictive painkiller that found a welcome market among the masses of idle youths. Tramadol, a synthetic opioid analgesic, is considered a controlled substance by the U.S. Food and Drug Administration, in the same category as well-known medications like Valium and Xanax. The WHO study cited the blockade, high unemployment among university graduates and never-ending conflict with Israel as factors associated with "widespread" Tramadol abuse. It said users turned to the drug to "escape problems," obtain a "feeling of relaxation," to "not think" and to fall asleep. Tramal, believed to be a more addictive black market form of Tramadol, arrived later, gaining popularity after the first war between Hamas and Israel in 2009. Tramal was cheap, less than 50 cents a tablet, and people discovered its sedative effects at a time when they were "trying to overcome their anxiety because Gaza was a very traumatic environment," said Dr. Ashour. Experts in Gaza say the drug is illegally manufactured in India and has higher amounts of opioid and possibly hashish and toxic substances. The illicit pills are also much more addictive. Dr. Elyad Davidson, head of the pain relief unit at Israel's Hadassah Medical Center, said both drugs in Gaza are variants of the medication known generically as tramadex — a type of opioid typically prescribed as a painkiller, but which also increases levels of serotonin, like antidepressants. While tramadex is not as potent as morphine, "there is no doubt that it is addictive," Dr. Davidson said. Some countries don't view it "really as an opioid," which he called a "mistake" that can lead to wider use and addiction. He said patients who become accustomed to high doses experience painful withdrawal symptoms, such as anxiety, diarrhea, sweating and vomiting. "If you stop taking an opioid, your body will react in a full-blown withdrawal," he said. Abu Karim, a 29-year-old Palestinian father of five, said he began taking Tramal five years ago after a friend told him it would help him smoke his water pipe, or shisha, without coughing. He declined to give his full name because of the stigma surrounding addiction. "I liked it, so I began taking it for shisha, then to relax," said Abu Karim, a thin, pale figure wearing a sports hoodie with matching pants. But in recent months, prices have shot up. A single pill can cost about $20, well beyond most people's means. Being a health worker himself, Abu Karim was able to get prescriptions to buy the milder Tramadol legally and more affordably. "It was not as powerful as the smuggled Tramal, but with more pills, it does part of the job," he said. Today, he's among the few patients at the Hope Center, the first and only rehab facility in Gaza. Since opening at Gaza's only psychiatric hospital in 2017, it has treated 230 people, 90 percent of them tramadex users. While speaking, Abu Karim complained about dizziness and numbness in his left cheek. He told the nurse his stomach was "boiling" and his tongue was "heavy." The nurse assured him these are withdrawal symptoms and led him to his room, which had two beds with red mattress covers and a caged window, and gave him an injection. "I tried to give it up on my own, but every time I faced difficulties, I surrendered. Now I'm tired, so I decided to come here," Abu Karim said. The 15-bed Hope Center is equipped with monitoring cameras and a metal-locked entrance to prevent patients from leaving. Over three weeks, they are treated for withdrawal symptoms with lower doses, counseling and psychological support. Patients are admitted willingly, but the center has nowhere near the capacity to treat the vast number of addicts. Doctors say they need a national center with more facilities. In the meantime, Hamas' anti-drug police are cracking down on supplies. "Tramal smuggling has become a national security issue," said police spokesman Ayman Batniji. The Health Ministry has curtailed Tramadol imports and banned four kinds of over-the-counter drugs, including Lyrica, a potent painkiller for patients who have undergone amputations. Police have seized hundreds of thousands of pills. Nearly a year of border protests against the Israeli blockade have added a new element to the crisis. Hundreds of young men have been shot by the Israeli army, which says it is defending its border. Mahmoud, a 29-year-old, said he became addicted to Lyrica after he was shot during a protest. Unemployed and unmarried, he is now being treated by Dr. Ashour. "I don't want to reach a level in which I lose my personality and dignity because of the drugs," said Mahmoud, who would not give his family name because of the social stigma associated with addiction. "I want to stop."